We use more than 20 years of data from the National Longitudinal Survey of Youth 1979 to examine wealth trajectories among mothers following a nonmarital first birth. We compare wealth according to union type and union stability, and we distinguish partners by biological parentage of the firstborn child. Net of controls for education, race/ethnicity, and family background, single mothers who enter into stable marriages with either a biological father or stepfather experience significant wealth advantages over time (more than $2,500 per year) relative to those who marry and divorce, cohabit, or remain unpartnered. 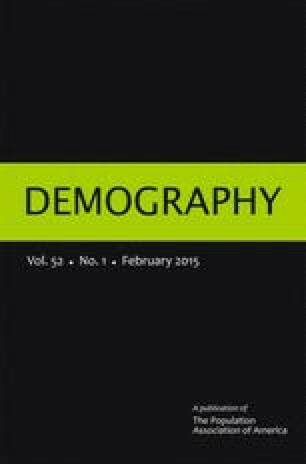 Sensitivity analyses adjusting for unequal selection into marriage support these findings and demonstrate that race (but not ethnicity) and age at first birth structure mothers’ access to later marriage. We conclude that not all single mothers have equal access to marriage; however, marriage, union stability, and paternity have distinct roles for wealth accumulation following a nonmarital birth. The first two authors contributed equally. The authors would like to thank Jonathan Vespa for comments on a previous draft. This research was supported in part by Grant Number R01HD054866 from the National Institute of Child Health and Human Development (PI: Kristi Williams). The content is solely the responsibility of the authors and does not necessarily represent the official views of the National Institute of Child Health and Human Development or the National Institutes of Health.